Last year, I talked to Kim and Matt about doing some twittery fiction, started writing some, got bogged down in trying to make it good, and then abandoned it. But this is the year of getting more work done, so I went back to it briefly and brutally, and here’s something over-long, with gaps in it, definitively unfinished. One of the characteristics that interested me most about Twitter is pacing – the frequency between messages, and their speed. I wanted to explore that rhythm, and to try write within the Twitter’s natural scene – that of the mundane commute, meetings, coffees: office-desk rather than kitchen-sink realism. Or rather: I wanted to start from that realism, because no-one, when they write “running” on Twitter, is actually running. They’re reporting after the fact, announcing an intention, or fabricating. Which is the second interesting thing – Twitter’s performativity. Twitter is as much theatrical performance as conversation. Un-realism. So: a story empty of character and reasonable plot, and a blank-sheet MacGuffin. A story for an audience of 85, and a tentative use of direct messages that only a few of the audience will receive. The story takes place over a single daytime, and was pruned down from 100+ messages to a slightly more wieldy 25 odd, but that’s still too many for the recipient to eyeball. But here, this was it, with the times I scheduled (with Twaitter) the messages. 0821 / As I left the train, a dark suit bumped into me heavily. He grabbed at the sheets of paper in my hand but I pulled free. 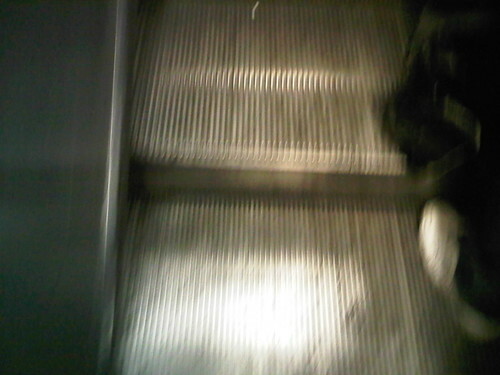 0824 / I started walking up the escalator. After a moment he followed, taking the steps two at a time, rapidly. Two others followed him. 0832 / When I flex they re-open sharply as if re-cut every time the escalator step completes a full circuit. Have I left skin on its teeth? 0838 / But then – no sign of the men as I got to the train station. The next train was leaving in a couple of minutes. Just made it. 1000 / Relaxed a bit. Late commuters respecting social space and taking seats evenly spaced from each other. None of them look out of place. 1010 / The escalator climbs a mile and a half hourly for about 19 hours every day. 1030 / Why grab the sheets of paper? – they’re blank, scrap, empty. And did I see a weapon? This isn't real. 1040 / The sheets of paper aren’t new. No printed, written or distinguishing marks. Nothing except creases - minimal evidence of my fall. 1110 / I hold them up to the window. The train and the sunlight turn them to overlapping, translucent panes. Fluttering drafts. 1330 / I think those men are now in this carriage some seats away. They arrived separately, but all watch me without eyes ever alighting. 1345 / Tried to call the office and home, but voicemails everywhere. And what message could I whisper? The police wouldn’t believe this. 1430 / The watchers are alert at each station to see if I leap off: they tense, ready to spring up. 1500 / I imagine attacking: sitting next to them. But none of us can move – we’re trapped between the protocols of commuting and of the chase. 1530 / Again I think: is this happening? My mobile buzzes with a sender-less message: RT : @rod keep the papers from them! 1534 / I look up. The first man is standing, at last looking directly at me, unblinking. I shiver, frozen. 1600 / The train is slowing. Two other men step up and flank him, move forward as one. I stumble backwards, towards the end of the carriage. 1605 / I step into the vestibule between the carriages. It twitches like a huge gullet - a sudden sense of scale dropping away from me. 1608 / They grab my arms, snarl "Paper now!" Pull free as train lurches. Free hand waving madly in front of the door sensor. 1700 / In the last carriage, last door. Train pulls in. Again we ape commuter behaviour: ignore each other during the pause before the door opens. 1705 / I hurry out fearfully, they saunter. One pursuer remains on the train, his face distorted and delayed in glass. 1710 / Called police – on hold. No time. Run away from the station - empty streets. They let me run, then make ground without effort. 1715 / Sun setting, shops shut. A building ahead – lit. A library. Run up steps and straight into the ranked shelves. 1719 / They soon follow, well drilled, fanning out. Look back – shadows among the dim stacks. 1745 (direct message to c.6 people) / My skin on the escalator will now have travelled fifteen miles, rotating inexorably, catching me up and leaving me behind. Related/influences/inspiration: Novels in three lines, Ian Bogost’s Bloomsday, Will Ashon’s Trundlespike, Tom Armitage’s Twit4Dead, very short fiction passim, David Markson, ‘The Purloined Letter’, Duchamp meets spy fiction - particularly Geoffrey Household’s Rogue Male, Jonathan Safran Foer's collection of blank paper, Candida Hofer's libraries.